Luring butterflies to your property is the best thing you can do to cultivate a healthy, beautiful landscape including floral borders, annual beds and cutting gardens. These pollinating powerhouses simply adore a well-designed garden that features plants that supply butterflies with enough nectar to keep them well-fed and happy. Our fantastic Butterfly Beacon Annual Collection includes a mix pollinator-friendly perennials. Orange Milkweed is a favorite of Monarchs and other species, plus the vibrant orange-red flowers and foliage-laden shrublike form make it a fantastic addition to any property. 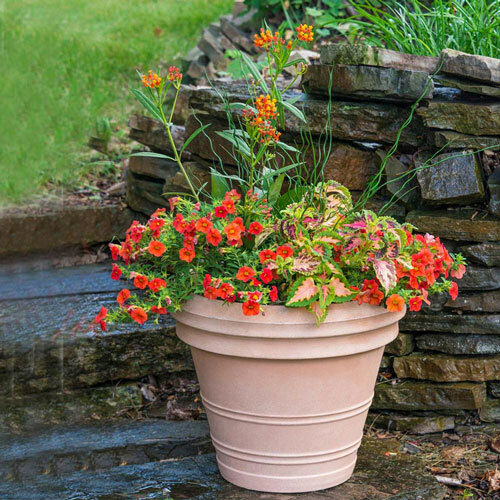 Noa™ Papaya Calibrachoa, with its graceful trailing habit and soft coral blossoms look phenomenal when in full bloom. 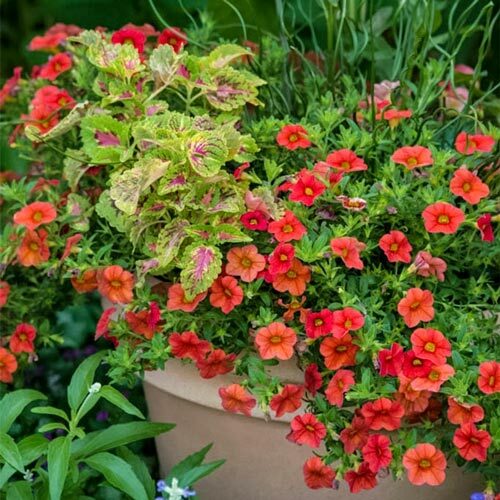 Acting as a vivid backdrop to these flowering varieties, Wizard® Coral Sunrise Coleus is bright and beautiful with large, colorful leaves—ideal for containers. The spiraling, twisting foliage of Big Twister Juncos creates a dramatic effect. Give this well-balanced blend of hues, forms and sizes a try… we're sure you'll be pleased with the results. 3" pots. Unique CharactersticsMilkweed is a great food source for Monarch butterflies. Butterflies are also attracted to calibrachoas. The other two are colorful and textural fillers.